21 March, 2015. It was a Saturday. In the last two posts of this series which you can find here and here I started to implement the server side of a complete Angular JS application that uses CQRS and Event Sourcing as architectural patterns and stores the events created by the aggregates in the domain in GetEventStore. All this runs on my Ubuntu 14.10 Linux VM which is hosted in Hyper-V on my computer. After we have successfully implemented the code that handles an incoming command, dispatches this command to the domain aggregate and stores the event(s) created by the aggregate in GetEventStore (GES), it is now time to start implementing the code necessary to build a read model from the events stored in GES. Our first read model will use MongoDB as the data store. Due to the fact that I changed my job and am now with Clear Measure my blog got a bit neglected. I had to first digest the many changes that awaited me there. Clear Measure is an awesome company and… we are hiring! If you are passionate about software development and are eager to work with great people then please apply. If we are creating our read model this way the code is really simple to implement a new or extend an existing observer. In my company we use this approach a lot and it makes our lives quite easy. In this particular case if we add another recipe related event that the observer needs to handle we just need to add another When method to the class that handles the new event. Most probably this event will be used to update the existing recipe and thus we’ll use the Update method of the writer. Save the file and in a terminal run kpm restore to download and install the new package. To access MongoDB we need a connection string. If MongoDB is installed locally we can use “mongodb://localhost”. In this case we inject the connection string to use via constructor injection. When the Add method on line 20 is called then we need to first determine to which MongoDB collection the new item shall be added (line 22). Once we have the collection we just add the item (line 23). To get hold of the collection we have the helper method GetCollection. 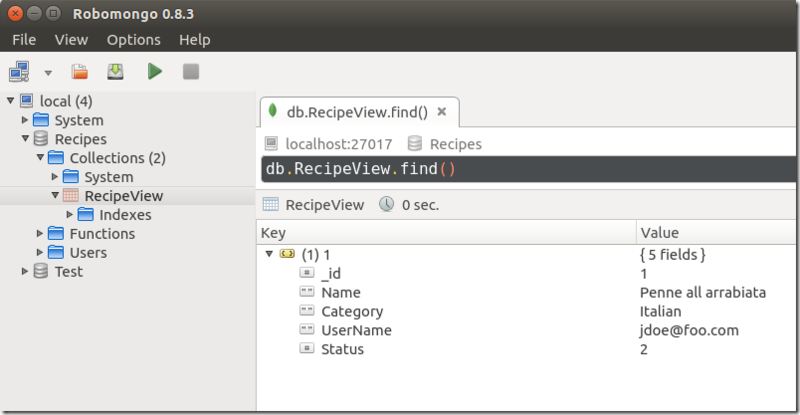 In the GetCollection we first create a new MongoDB client using the connection string. Through the client we get access to the server (line 44) and via the server to the database (which we conveniently call Recipes, line 45). Once we have the database we can get hold of the desired collection (line 46). This collection by our convention shall be named like the type name of the item, e.g. RecipeView. The Update method is only slightly more complicated. Since this is an update we assume that there must already exist an item in the collection that has the given Id as primary key (line 28 through 30). If we do not find such an item then we have a fatal error and we throw an exception. Otherwise we use the update action passed to the method to update the existing item (line 35) and save the updated item back to the collection in MongoDB (line 36). On line 15 we create a new instance of the MongoDB projection writer passing in the connection string for our locally installed MongoDB server. On line 17 we first create a new recipe and on line 25 we try to update the just created recipe. 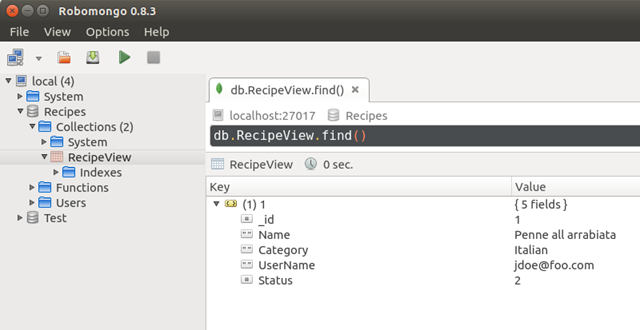 Clearly our code has created a new collection RecipeView in a database Recipes and we also see that in this collection there is the expected recipe with all its properties. In this post we have implemented the infrastructure need to generate a read model from our events. The read model in this particular case is stored in MongoDB. Creating a read model for other undelying data stores is simple. Samples are Lucene.Net, the file system or a relational database. We only need to create a storage specific implementation of the interface **IProjectionWriter** and we’re done.